So first off… you launched the New York office of SixtyFour Music last year. It would be great to hear about your musical career to date and what’s lead you to this point? Yes, we have just celebrated our first birthday in the US, it’s been hard work but we’re off to a strong start. I re-joined SixtyFour Music (fka Wave) after a 4-year hiatus running my own agency Catalyst Music & Sound in the UK in London. This stood me in good stead to help launch SixtyFour Music in the US market. When I set up Catalyst I had to learn how to operate an agency overseeing everything from creating the branding, building the roster, running the accounts and negotiating deals with labels, talent and staff alongside leading all of the music supervision and creative across multiple projects. I took this opportunity to regroup with the team as Nick Payne the MD is brilliant to work with and I couldn’t say no to living in New York. It has been great fun working with Nick on launching the brand here and growing our team. 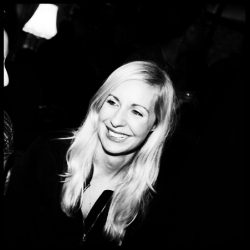 Prior to becoming a Music Supervisor, I trained as a Radio Producer firstly through running my university radio station and then landing a job producing specialist music shows for the BBC with Gilles Peterson, Mary Anne Hobbs, Zane Lowe, Pete Tong and many more. I was very fortunate to learn how to produce live music from some of the world’s best Engineers at the BBC where we recorded some legendary live music sessions with Cinematic Orchestra, Portico, Q Tip, Four Tet, Steve Reid, Common, Seun Kuti, Little Dragon, Floating Points, Raphael Saadiq. I was also lucky enough to travel and record music documentaries and programmes everywhere from Serbia to Tokyo. I studied film and documentary whilst at university in Liverpool, I was always the go-to Music Supervisor for our films and loved it; I ultimately knew I would end up doing this as a career. What’s behind the name, SixtyFour Music? 1964 was a seminal year in music. Top of the Pops was broadcast for the first time by the BBC. The Beatles landed in New York and started the British Invasion. Dr Robert Moog invented the first synthesiser. Simon and Garfunkel made their first recording for Columbia Records. The Rolling Stones released their debut album on Decca Records and Shirley Bassey recorded her timeless theme for Gold Finger. It only seemed fitting that we name our company after such an important year in musical history. SixtyFour New York is an expansion of one of London’s biggest music and sound houses. You’ve been heading it up for a year now; can you tell us a bit about how it’s going? It’s been going fast! The first year of a new business can be especially challenging but on the whole, I’m pleased to say that we have launched successfully here. The US is an extremely crowded marketplace, the standard of creative music work here is high, launching over here was always going to be a risk. I have worked relentlessly hard on every project we have been hired for and we have continued to work with our roster of composers who are extremely talented and experienced. Having the right talent in place has enabled us to deliver high quality results. A lot of effort goes into everything we score and we take the time to research music thoroughly and deliver the best options to our clients. It means that I haven’t had much sleep yet, but we’re making a good impact. We have just hired two new Supervisors, so that is helping me out on the sleep front! How does SixtyFour make sure it stands out from the sea of competitors there? I would say the quality and level of talent with film composers like Guy Farely, Ceiri Torjussan and Robert Guyla on our Roster. We also have KLANG, Austen Corbin, Ben Price and pop producer Pete Davis who have years of experience writing scores and they are all classically trained. Wave Studios New York will be launching here later this month in the same building meaning that we can collaborate on music, sound and mix on projects. Alongside our advertising work, we also supervise feature films with Directors such as Yorgos Lanthamos. What’s the approximate ratio of original compositions vs. existing music you’re finding clients are requesting at the moment? This varies from week to week, which keeps things interesting. At this point in time today I am negotiating across three spots, so I am in licensing mode. There are weeks when we are more focused on recording demos with Composers. I really like the variation of work - it never gets boring. We also do other projects outside of licensing and composition work, I am currently working on a sound installation based on a mountain range in Scotland and a creative music strategy to help save the oceans. And lastly, what are SixtyFour Music's plans for 2018? We’ll be helping Wave Studios New York open up and continuing to grow our client base here. We would like to expand and set up offices in other cities at some point. There is another feature film in the pipeline and we are looking to sign more US composers and artists to our label Hummingbird Music.